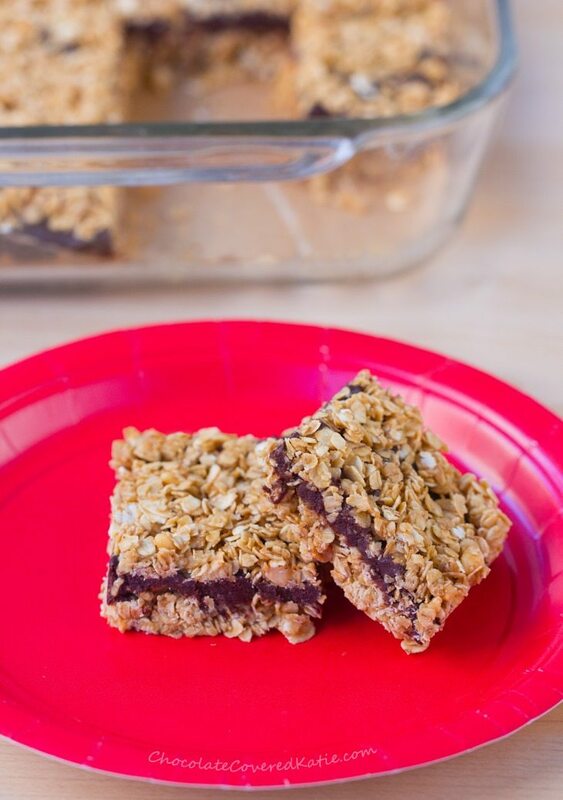 A chewy oatmeal crumble engulfs smooth dark chocolate banana fudge in these deliciously good-for-you snack bars. 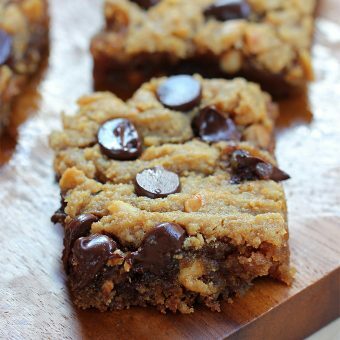 These homemade banana fudge bars are based on the popular Oatmeal Chocolate Fudge Bars and are actually lightened up even more than the originals! Any banana lover will go crazy for the sweet chocolate-banana fudge centers. The bars don’t need to be refrigerated, making them perfect to pack in a lunchbox or take as a nutritious on-the-go snack. 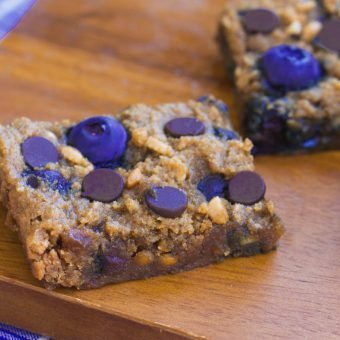 If you want to make these bars completely nut-free, feel free to sub out the peanut butter for sunbutter or coconut butter. Or you can try using a regular butter spread (such as vegan Earth Balance), but I haven’t tried that variation yet. These little fudge bars always go quickly at parties, so it’s a good idea to make a double batch if you want leftovers. If you make a batch of these bars, be sure to tag me @ChocolateCoveredKatie on Instagram so I can see your creations, and I’ll share some of your pictures on my Instagram feed. *If you want a thicker chocolate layer than what’s shown in the photos, feel free to double the amount of chocolate chips and banana. Line an 8-inch pan with parchment or wax paper. Set aside. If nut butter isn’t easily stir-able, gently heat it. 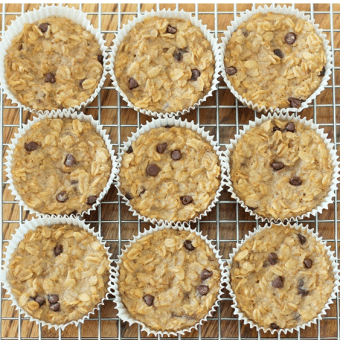 Stir the oats, salt, maple syrup, nut butter, and water together until evenly combined. Transfer 2/3 of this mixture to the prepared pan. Press down hard, using a second sheet of parchment to press it evenly into the bottom of the pan. Carefully melt the chocolate chips in a new bowl, then stir in the banana until smooth. Spread this mixture on top of the crust. Sprinkle remaining oat crumbles on top of the chocolate, and press down. 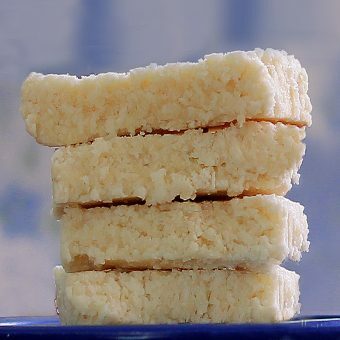 Refrigerate or freeze until firm enough to cut into bars. These look like an awesome on-the-go snack! Can’t wait to try them! These look and sound absolutely amazing! I’ll have to remember this for the next time I need to bring dessert somewhere..
Oh…which to make first? These or the no banana original version…? If you were forced to pick one only, say as your survival food on a “dessert island” 😉 which would you choose? Of course you can change your mind later! I like the way you expanded the chocolate layer with the banana! 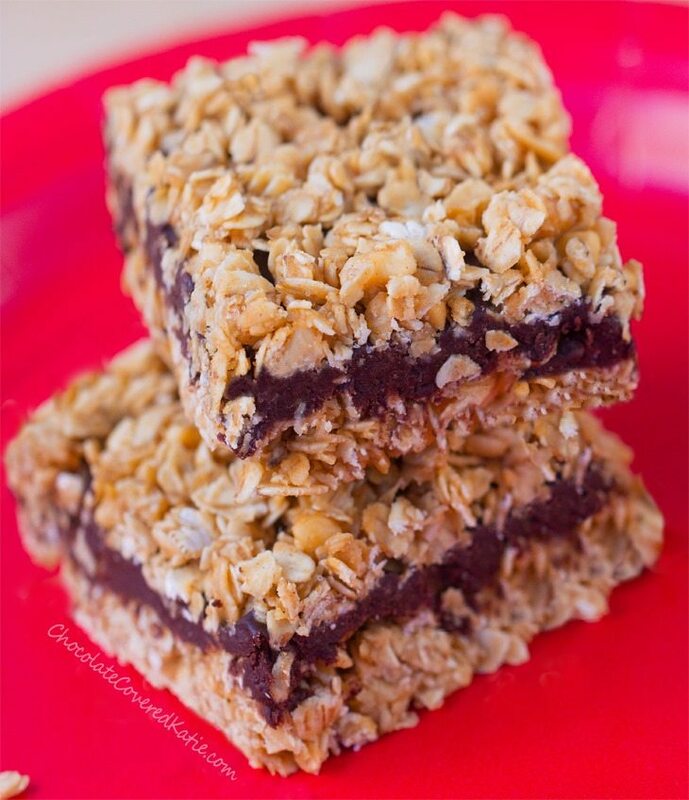 I am wondering if I could substitute old fashioned oats for the quick oats in this recipe and/or in your black bean brownie recipe. Would they turn out the same, or are quick oats required? Thanks! The photos look good enough to eat! I can’t wait to try this in my own kitchen! 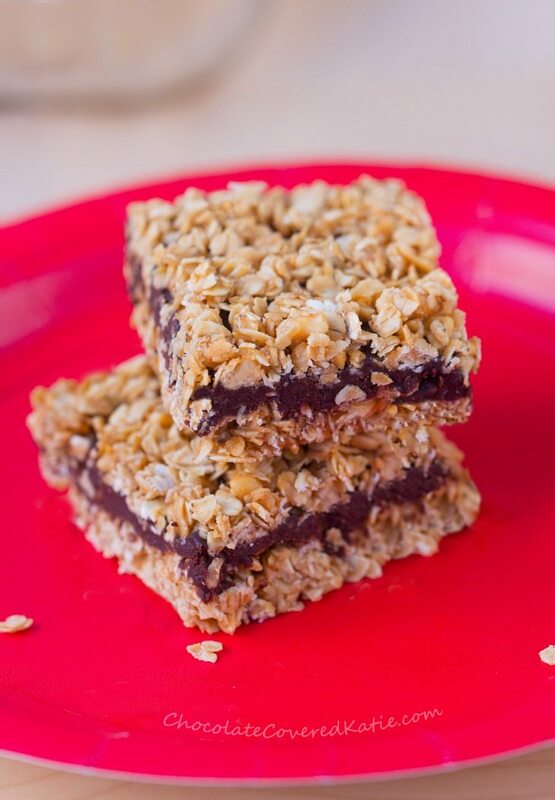 I am such a bar fanatic, and anything with granola and nut butter are my favorites! I will definitely have to try these out! I’m allergic to bananas…so sad! Can you suggest something to substitute?? 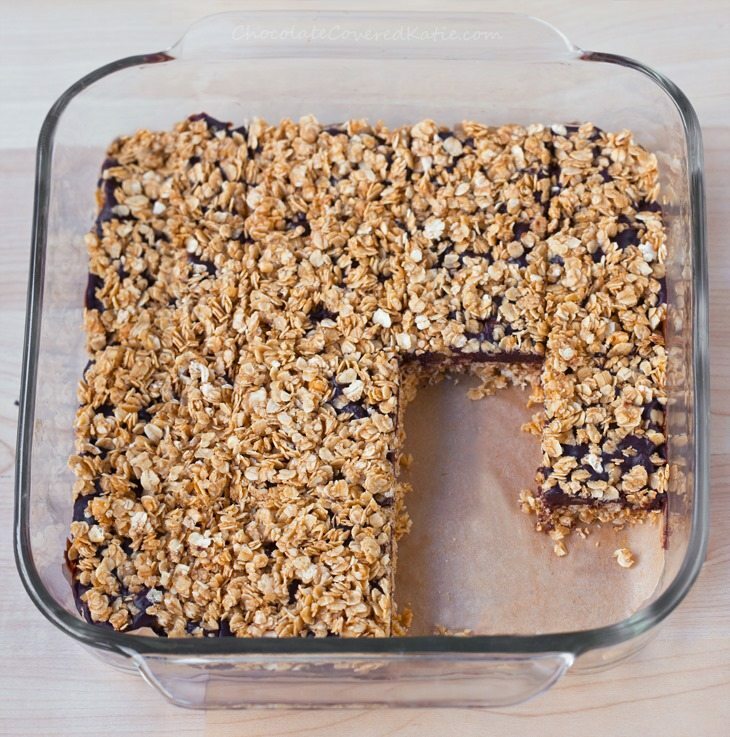 I love love LOVE this recipe – it’s actually pretty dangerous for my boyfriend and I. But I do have a question: Honey is just so expensive, can I replace the honey with white corn syrup or will it drastically affect the taste? I love the honey in it, just can’t afford it all the time.. you know… renters problems… thanks for never disappointing with your recipes Katie!! Stay amazing! I totaly recommend renting/buying book called “swallow this” by Joanna Blythman to see what is in the food. I didn’t notice it called for quick oats and I never buy those so unwittingly I made it with old fashioned oats. They turned out great. Maybe they would be a little chewier than quick oats but that’s not a problem for us because we have teeth and we know how to use them! I will say we are trying to reduce sweeteners in our food since they add calories, are not great for your teeth, and now appear to contribute to heart disease so I REDUCED the maple syrup to 3/8 cup. I honestly don’t think you need the extra 1/8 cup that the original recipe suggests. Since we use real maple syrup that also saves a few sense. This recipe is definitely worth making again. Delicious! That should say “saves a few cents.” Sorry. Just made these yesterday and they are awesome. My kids asked if I could make them more crunchy? Do you think I could bake these to get some crunch? And if so, at what temperature, for how long? Avocado instead of banana would be good. Gonna try it! Hi. For the nutritional value on these, is it if you make 12 or 16?